Many believe the 1992-93 NHL season was among the finest staged in the League's history. From the addition of two teams through expansion, to the sudden prominence of European players to the heroics of Pittsburgh's Mario Lemieux, to the crowning of Montreal as Stanley Cup champions, the season was full of memorable moments. On its 20th anniversary, NHL.com will spend the year looking back at the key moments of that 92-93 season to see if it may indeed be the NHL's Greatest Season. During an illustrious Hall of Fame career, Pat LaFontaine had opportunities to skate with many of the NHL's greatest offensive performers. The list included Mike Bossy of the New York Islanders at the start of his career, and Alexei Kovalev of the New York Rangers in the twilight of his 15 seasons in the League. 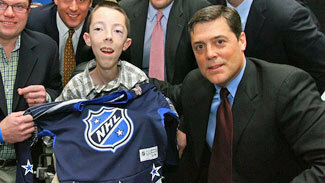 It has been 16 years since Hall of Fame center Pat LaFontaine introduced children and families of North America to his Companions in Courage Foundation. Companions in Courage (CiC), an organization used to build interactive game rooms in children's hospitals, was founded by LaFontaine as a response to the inspiration he derived while visiting children in hospitals during his playing career. "I learned when I played the game of hockey that everything happened quickly," LaFontaine told NHL.com. "You chase the next puck, you try to score the next goal and you got the next bus and plane. But in the game of life, it's a process. You learn to be patient and open your eyes to all the opportunities. The thing about CiC, it really evolved from special relationships I had with kids during my days with the Buffalo Sabres (1991-97)." The organization also distributes mobile Xbox kiosks and features Cisco's online conferencing system WebEx, which allows young patients to connect to family, friends, schools and teachers anywhere in the world during a hospital stay. "We're just conduits ... the kids are the inspiration," LaFontaine said. "They're the ones behind the rooms. We're only here to provide that room and the ability for them to escape. The one thing very special about these rooms is that they are healing centers. There are games and computers and age-appropriate programming, and it gives a child a chance to escape what they're going through each and every day. Not only does it affect the children, but the families and siblings. The rooms promote healing." The foundation has opened 17 Lion's Den rooms throughout North America, including five in conjunction with the NHL, in Montreal, Boston, Pittsburgh, Ottawa and Calgary. The most recent Lion's Den opened Sept. 13 at Kravis Children's Hospital at Mount Sinai in New York City. "Companions in Courage evolved from children's inspiration and a CiC book, and then just took on a life of its own," LaFontaine said. "That first one was the hardest, and a lot of people told me to throw in the towel, but the game of hockey taught me about perseverance. Going through my own injuries and bouncing back ... so we stuck with it and I was lucky to have a right-hand guy in [CiC executive director] Jimmy Johnson, who had the same passion as I did." On June 19, LaFontaine was presented a Jefferson Award during a ceremony in Washington, D.C. The Jefferson Awards are a prestigious national recognition honoring community and public service in America. It long has been referred to as the Nobel Prize for philanthropy. And as a member of the Buffalo Sabres in 1992-93, there were Alexander Mogilny and Dave Andreychuk. "That season was really special," LaFontaine told NHL.com. "I played on that line from day one when I arrived in Buffalo and knew it would be hard to duplicate that year ... having those guys as linemates." Flanked by Mogilny and Andreychuk, LaFontaine racked up a career-high 95 assists and 148 points, which remains the highest total recorded by an American-born player in a single season. No American has come close. Brett Hull held the previous record with 131 points in 1990-91 and Kevin Stevens had 123 points in 1991-92. "There are a lot of tremendous players out there, and it's a proud feeling [to still hold that record]," LaFontaine said. "Records are made to be broken and it's nice to put a mark out there for guys to seek, but it was just one of those special years that you cherish. "It's nice to know you had one of those seasons where everything went right as far as the regular season, but I would have traded all those points if it meant a victory over the Montreal Canadiens in the [Stanley Cup] Playoffs that season." Through 11 regular-season games in 1992-93, LaFontaine had 30 points; seven games later, on Nov. 17, 1992, the total was 40. He'd reach 100 points on an assist in his team's 55th game. However, the Sabres ultimately were swept by the eventual Stanley Cup champion Canadiens in the Adams Division Finals. "It just seemed like Alex and I knew where each other was and Dave came in and cleared the zone in front of the net and picked up a lot of rebounds," LaFontaine said. "There was a sixth sense with guys knowing where to be and none of us even had to look ... it was kind of reactionary. When the whole is greater than the sum of its parts and when you're firing on all cylinders, you're going to have a lot of fun." What people forget is that if Andreychuk wasn't dealt to the Toronto Maple Leafs in exchange for goalie Grant Fuhr in February that season, the Andreychuk-LaFontaine-Mogilny line might have been the first and only one in League history to have three players with 50-plus goals in the same season. As it turned out, LaFontaine had 53, Mogilny had 76 and Andreychuk finished with 54, including 25 following his trade to the Maple Leafs. "We would have been the first line in the history of hockey to do that," LaFontaine said. "I guess you can say I was able to feel what it might have been like playing for the Edmonton Oilers in the 1980s." LaFontaine, who admitted he pestered Mogilny to shoot more that season, said he always will admire the tremendous hands and acceleration exhibited by his Russian linemate. To this day, LaFontaine doesn't believe he's seen a player faster than Mogilny from blue line to blue line. "I would just get the puck and look and knew he was taking off. And once he got the engine running, it took only four strides before he was already at full speed," LaFontaine said. LaFontaine was asked if that 1992-93 season was the most memorable of his career. "I had a lot of fond memories over my career," he said, "but 1992-93 was special because it was my best offensive year and it was a lot of fun playing with those guys. I cherished my season as a New York Ranger [in 1997-98], and in 1989-90 with the New York Islanders even though we lost to the Rangers in the first round." LaFontaine had 105 points, including a career-high 54 goals, with the Islanders in 1989-90, but would suffer the first of many concussions during the team's opening-round playoff series against the Rangers. In 1997-98, his final season before retirement, he had 23 goals and 62 points in 67 games as a member of the Rangers. LaFontaine also was part of one of the most memorable NHL scoring races in 1992-93, when he and Pittsburgh Penguins center Mario Lemieux went point-for-point down the stretch. He recalled his lone season with the Verdun Juniors of the Quebec Major Junior Hockey League in 1982-83, when he produced an eye-popping 104 goals and 234 points in 70 games to win the scoring race over Lemieux, who had 84 goals and 184 points while playing for the Laval Voisins. "I remember going head-to-head with him when I was 17 in junior when he had a good lead at Christmas-time and I was able to win it in the end ... probably the only time he lost the scoring race in that way, and he remembered that," LaFontaine said. Lemieux ultimately would turn the tables on LaFontaine in 1992-93 despite playing 24 fewer games after being diagnosed with Hodgkin's lymphoma on Jan. 12, 1993. When Lemieux returned to the Penguins' lineup two months later, he trailed LaFontaine by 12 points in the scoring race. "I would remember having a four-point night and they'd say Mario got five; I'd have a five-point night and Mario would get six ... it was crazy," LaFontaine said. "When I look back on that, the story of his comeback and winning that scoring race is remarkable. The inspiration he was for so many people out there who were going through the same thing. "Hey, I'd finish second any day of the week if it meant having a story like that unfold right before our eyes." Lemieux, who earned his second of three Hart Trophies in 1992-93, finished the season with 69 goals and 160 points in 60 games. Even though he fell short of the scoring crown, LaFontaine said 1992-93 would forever be etched in his memory bank. "I played with great players at different times during my Islander days and was very fortunate," LaFontaine said. "I spent my first three NHL seasons under Al [Arbour], so nothing was handed to me. I had to earn every opportunity. That overtime playoff goal in 1987 against the Washington Capitals was when my career started to go forward. In 1992-93, I was able to figure out what it was like to earn more ice time and to play with guys like Mogilny, Andreychuk, [Dale] Hawerchuk, [Doug] Bodger and [Donald] Audette." In the process, he learned the importance of gaining the respect of his teammates and competitors. "I learned how you could elevate not only your play and the team's play, but the people around you," he said. "But you had to earn that right, earn the respect, and when you finally got it, just go with it and enjoy it. Looking back, it made me appreciate that time in my career because just as everything was starting to rise as a member of the Islanders, it all came to fruition in my years as a Sabre."